As I shared during the Tuesday Twister, I am in the mood for beans. Apparently, so is my family. We have enjoyed two chilis this week. 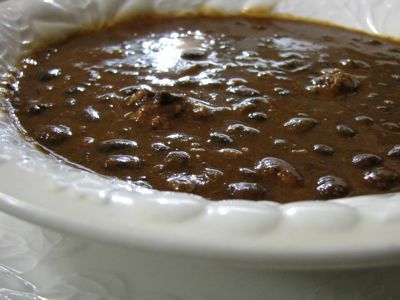 Black bean chili is our favorite. Everyone says so every time. Sometimes I make this chili by sprouting the beans for a day or two, to the point where they sport barely a sprout. Like this, they can be added to a dish and will cook up very quickly – in about twenty to thirty minutes. See Sprouted Bean Chili. This week, I did not sprout these black beans, but rather cooked them like normal (soaked them and then cooked for 12 to 18 hours on low in the crockpot until tender) ahead of time and then added them to the chili-in-the-making. There are many, many ways to flavor chili. This is our favorite. I think my husband would like a spicier chili, and perhaps C. would too, but none of us girls like spicy. So we're all very content, satisfied, and happy with the following flavor combination. Feel free to share how you flavor your chili in the comments! I routinely double this recipe. garnishes: sour cream, diced onions, chopped cilantro, shredded cheese, etc. Brown together in a medium or large stockpot over medium to medium-high heat: ground beef, onions, and garlic. I leave the meat somewhat chunky – this way everyone gets a few decadent-sized pieces in their bowl, rather than a million miniscule pieces. That's just what we like. Combine the tomato paste and water in a 4-cup measurer, and whisk until smooth. Add to the meat mixture. Add the beans and all spices. Bring to a simmer, then turn down heat and let simmer for 20 to 30 minutes to develop flavor. Adjust seasonings. Serve with desired garnishes. 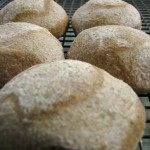 We ate our chili last night with rolls made from spelt sourdough (not gluten-free). Chili are so wonderful for the winter time. So hearty and filling and warming. Thanks for sharing your recipe as part of the carnival. Your recipe looks delightful. .-= Kimi @ The Nourishing Gourmet´s last blog post… Pennywise Platter Thursday 9/17 =-. This sounds delicious! I’ve never thought to sprout my beans before cooking…I am definitely going to try it. We love chili here too…now if only the weather would cooperate with us! .-= Kara ´s last blog post… The Best Chocolate Chip Cookies. Ever. Really. =-. .-= Marg´s last blog post… Places a kitten will sleep =-. .-= Lindsey in AL´s last blog post… Cake decorating 101 =-. Looks and sounds delicious! I am going to have to make chili soon. We like it spicy, so I will add a little more kick to it, but thanks for the idea and the recipe. .-= Bethany´s last blog post… Quick Big Picture of Classical Education =-. I have been craving some black beans and your recipe looks great! Thanks for sharing it. .-= Debbie´s last blog post… I will dance =-. lol…what a wonderful recipe..I have a confession to make, the first time i read it i didn’t have my glasses on and I thought it said that Jeff would like a spider chili, lol..lol..I thought boy he is brave and she is brave for making it! I tried the chili recipe yesterday and the flavour was great, except I misread the recipe and I soaked the beans for almost 2 days, and then didn’t cook them before adding the other ingredients. I thought the extra soaking was enough. So my chili ended up being crunchy black bean, but my family gracefully ate it, but they loved the flavour, so I am trying again today. I just made this last night. I had a frozen bag of chicken stock that sprung a leak in the freezer so I used that in place of the 4 cups of water. It was out of this world! Thank you for sharing! Leigh Anne — It freezes beautifully. Congratulations on your upcoming birth!